Many parents think the best times for kids to have dress-up time is only at Halloween time. This couldn’t be further from the truth. Children should have the opportunity to dress-up and have a variety of costumes all year round. Also, as many Christian parents prefer not to engage in Halloween activities, they’ve found that costumes still play an important aspect in their child’s development. Dressing up in costumes allow children to role play which gives them valuable social skills. Dressing up like an astronaut gives a young child the “experience” in what it’s like to actually be an astronaut through his imagination. When a little girl dresses up as a princess – it’s wonderful to see how many of her “social graces” suddenly appear as she practices good manners. Children also like to imagine what they want to be when they grow up and dress-up costumes are a great way for them to experiment with a variety of different occupations. Kids naturally want to pretend to be characters they admire, whether it’s to save the day as a superhero or dance through the wood as a care-free fairy. The learning process that goes on with a small child pretending and experiencing through dress-up is a valuable part of childhood. 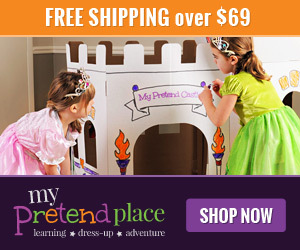 There are many places to find great costumes for kids online, one of the best ones we’ve found is the My Pretend Place, LLC. In addition to great costumes and themes, they also have a variety of recipes and crafts for little ones to further enhance their experiences.